Measure All The Guns, Even It’s Stupid. Typical (commie) bureaucratic Overreach – Make Up ‘interpretations’ of laws and ‘regulations’ to Oppress the People. Very Strange that a Jury was Cowed into accepting whatever the ‘government’ said as Truth. And, I don’t quite Understand the “Length of (trigger) Pull” being Important in the ‘definition’ of a “Short-Barrel Rifle”… AND the Fact that this ‘definition’ is/was OCCULTED (hidden) from the People who are expected to “Obey” it. 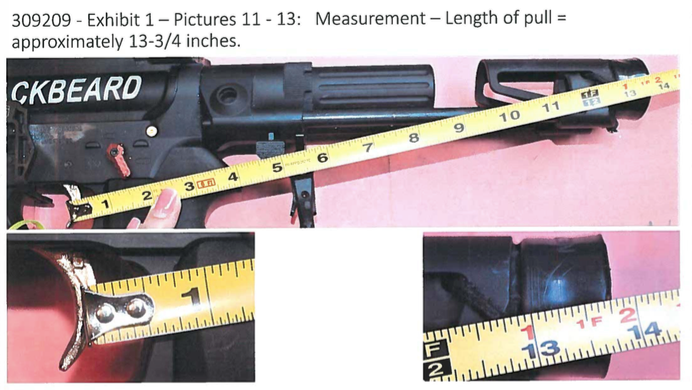 IMO, a very short stock with a Cramped ‘trigger pull’ (like when you collapse an adjustable Stock all the way on a Rifle-Length (Barrel) AR) makes for much less Accuracy in Aiming it using Sights; some Optics may still ‘work’, but it seems to Me that a Collapsible/Folding Stock, or “Pistol Brace” just doesn’t lend itself to Shouldering a Carbine and getting Good Results. The guy may have won his case, but I doubt he will ever get his property back. “Domestic violence” will make you a prohibited person so fast your head will swim. Perhaps, but that’s not the point I’m making. The main point has to do with the ignorance of the FedGov employee. You are currently reading "Update On ATF And DoJ Interpretation Of AR Pistol Braces", entry #20201 on The Captain's Journal. This article is filed under the category(s) BATFE,Firearms,Gun Control,Guns and was published November 4th, 2018 by Herschel Smith.